Here at Vitamin Solutions we manufacture a powerful form of vitamin C that has been scientifically shown to have the ability to penetrate through skin 12 times more effectively than pure ascorbic acid (pure vitamin C). This website uses case studies to show the results from the topical application of Dehydroascorbic Acid (DHAA) vitamin C serum to several persistant skin issues including thin easily torn and bruised skin, skin tears, infections, basal cell carcinomas, actinic keratoses, treatment resistant fungal skin and nail infections, flaking skin, side effects of some cancers and wound healing. Skin and blood vessels use collagen as the lattice material to hold cells together, repair damage, form scars, prevent leakage and protect from infection. Vitamin C is necessary for the formation of collagen and for the immune system to be able to fight infection. In areas of low blood flow and/or at times of very high demand for additional vitamin C due to infections, cuts, burns or illness the vitamin C level in skin can become depleted and it's here where the Dehydroascorbic Acid form of vitamin C can make a huge difference. Pure vitamin C comes in two natural forms in fruits and vegetables. The reduced form is the vitamin C we all know from supplements (it is actually Ascorbic Acid). The other form is Dehydroascorbic Acid. Both molecules are antioxidants but the Dehydroascorbic Acid (DHAA) is far better able to penetrate the skin and has more powerful anti-viral and anti-fungal properties, it is also the main form that transports vitamin C around the body. DHAA has many important roles in the body and is the only form of vitamin C capable of crossing the blood/brain barrier. DHAA is vital for many other cellular processes. Having both DHAA and Ascorbic Acid together mimics nature best. In some vegetables (swiss chards) all the vitamin C is often in the form of DHAA, while the vitamin C rich persimmon often has a 50/50 mix of both types. Usually vitamin C levels in fruits and vegetables given on dietary charts is calculated as follows - Ascorbic Acid plus DHAA = total vitamin C.
Douglas Kitt is an expert in the field of the DHAA form of Vitamin C and it's extraordinary properties, he has written several scientific papers including the one below. Topical Dehydroascorbic Acid (Oxidized Vitamin C) Permeates Stratum Corneum More Rapidly Than Ascorbic Acid. The results show that the DHAA form of vitamin C permeates skin at a rate up to 12 times faster than Ascorbic Acid (normal vitamin C). 63 year old female diagnosed in 2010 with carcinoid cancer. Primary tumor removed with part of her small intestine. Extensive liver metastasis This illness also causes rapid transit digestion and malabsorption of micro-nutrients. Her skin was in very bad shape, it was very thin and fragile, easily bruised or torn, bruises would spread for up to a week after injury, prolific skin shedding was evident and cuts and bruises were very slow to heal. While it appeared to be a micro nutrient issue she was unable to take oral Vitamin C or niacin due to carcinoid syndrome so she tried DHAA serum applied topically. She also used it as a mouthwash and gargle for her weak gums and loose teeth due to the suspected vitamin deficiency. The results were astounding, before long her friends and mine, plus my staff were asking for some, they often used it as a first line treatment or complementary to prescription medicine for just about anything affecting the skin, inside the mouth or throat. It has even been successfully used topically on hemorrhoids. Click on the links in the menu to read some of their their stories. Research shows DHAA delivers up to twelve times more Vitamin C at an inter cellular level in deep skin cells than topical ascorbic acid serums. The main reasons for the increased uptake is better penetration through the skin and DHAA uptake entering cells through different receptors in the cell wall. Ascorbic Acid uses SVCT receptors (sodium vitamin C transporters) and this path limits absorption by shutting down at a level of around 220 µmol/L. Dehydroascorbic Acid uses GLUT receptors that shut down at around 500 µmol/L. This means you can increase ascorbic acid levels in skin much higher by applying DHAA topically than you can by taking or topically applying pure ascorbic acid. DHAA is the same as Ascorbic Acid except that two hydrogen ions are missing. As soon as DHAA has passed through the protective layer of skin it is absorbed into the cells through GLUT receptors and a natural antioxidant called glutathione replaces the two missing hydrogen ions, thus turning the molecule back into pure Ascorbic Acid and giving the cell antioxidant protection. The depletion of glutathione caused by this is soon corrected by the immune system and after about a hour new glutathione is produced in those same cells. The really interesting thing to note is that instead of just replacing the amount of glutathione used, a significant surplus is made so the subcutaneous cells wind up being charged with a very high dose of ascorbic acid plus enhanced glutathione levels. The immune system is supercharged! It is also noteworthy that low glutathione levels are associated with the effects of aging. Another informative research paper below also discusses this effect. On infected areas the combination of Ascorbic Acid, DHAA and Glutathione act together rapidly reducing swelling and pain. We have observed several worsening infections undergo a complete turnaround in a matter of hours after applying our DHAA/Ascorbic Acid Serum. DHAA and Vitamin C appears to help wounds heal much faster. After around six weeks it noticeably rebuilds collagen and elastin integrity and strengthens blood vessels, capillary leakage is noticeably reduced. It may also improve the flow of oxygen and nutrients to the wound and enhance the lymph gland and the vascular endothelial system as swelling reduces soon after treatment begins. These actions give better protection against future leakage and swelling and improve the chances of reducing and overcoming infections. In an 89 year old female treated with DHAA Vitamin C serum for a badly infected toenail which had not responded to two courses of antibiotics we found a secondary condition common among the aged. 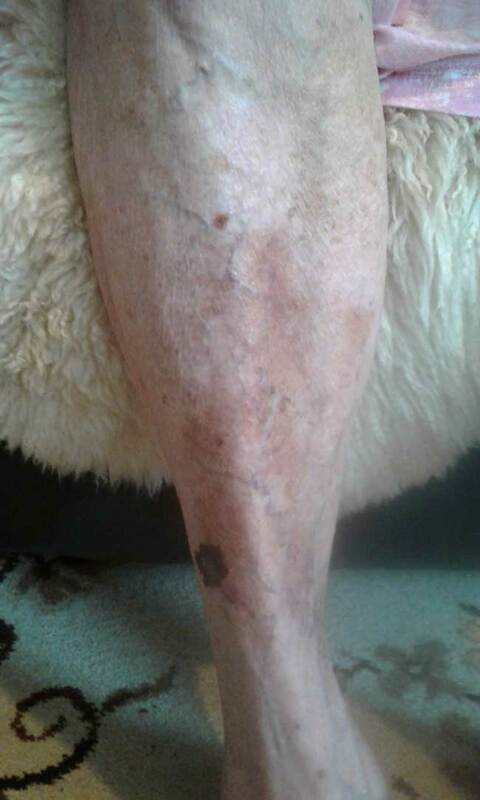 She had poor capillary integrity on the shins of both legs and scurvy like skin lesions. The skin was thin and fragile and bruising would result from the slightest knock. She was on blood thinners which would likely make the condition worse or may perhaps even be the cause. Deep bruising would occur in response to even slight knocks and blood would rise to the surface over a period of weeks or months before erupting through the skins surface. A full thickness layer of skin would then detach leaving an open wound which took months to heal. Several times in the past the skin damage was so bad the patient had to be treated at hospital. A decision was made to treat the toe and the skin of both legs from below the knee to the tips of the toes with DHAA Vitamin C serum. 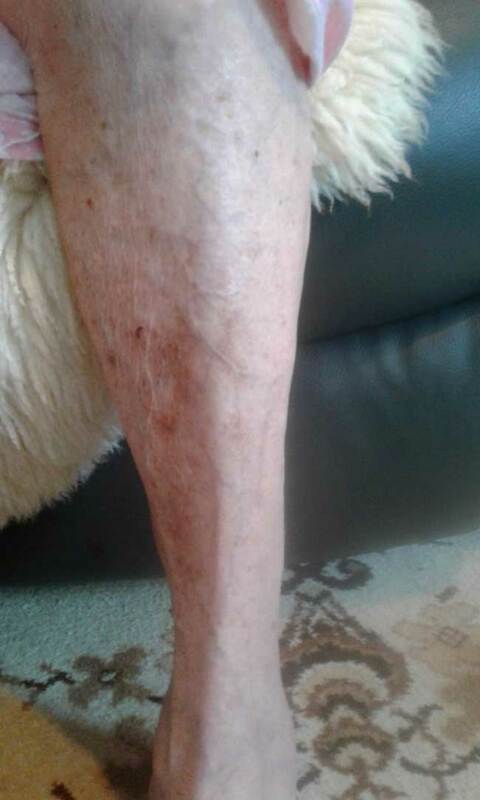 Photo below shows the leg after a slight knock around eight months prior to treatment with DHAA. It had improved somewhat before the DHAA Vitamin C Serum treatment was started, but it still had several open and encrusted areas of concern and capiiiary leakage/contusion. 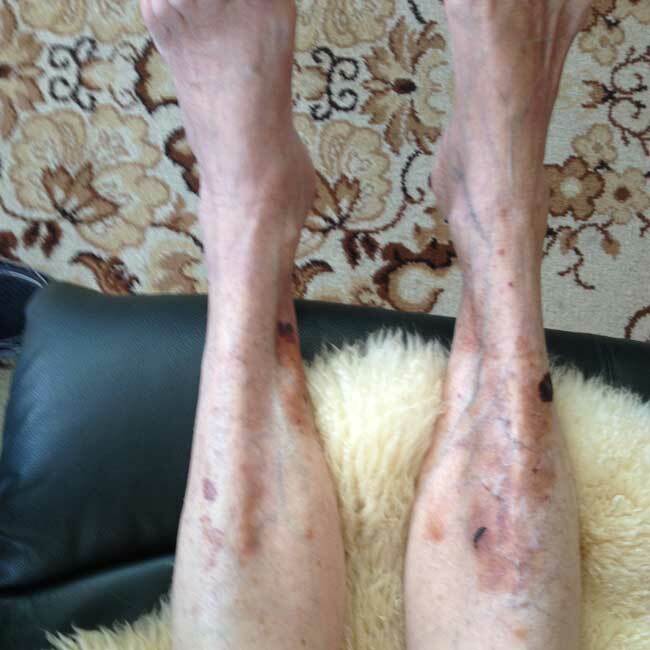 Photo below shows legs after six weeks treatment with the serum. Overall skin colour and skin thickness have improved but the biggest change is in how the scabs are resolving. The two darkest lesions on the right leg are months old and would normally shed completely leaving an open wound. Now they are healing in from the edges with new pink skin visible underneath. Capillary integrity is already showing signs of improvement as new bruises are not spreading as much or for as long and are starting to resolve without breaking the surface. Photo Below. Three weeks later and the skin condition and vitality is vastly improved. 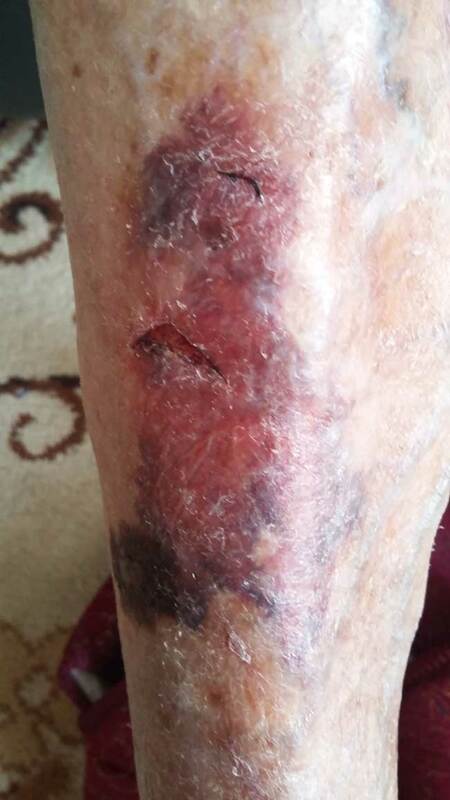 The lady also had a bad fall a couple of weeks earlier which required hospitalization, the caregivers were concerned that very serious bruises would erupt through the skin again as a consequence. However, after ten weeks of daily application of half a teaspoon of DHAA Vitamin C Serum she had a completely normal bruising response. Deep bruising was evident after the accident but the capillary leakage stopped quickly and the bruising subsided within two weeks. If you live in the United States you will need to purchase from the ReCverin website (we do not ship to the US). ReCverin have a wealth of scientific information regarding DHAA on their site. The two products are made differently. Our DHAA is far less expensive, it is made from only two pure natural products, vegetable glycerine and ascorbic acid. The ReCverin 50/50 uses the same ingredients but use a much more involved and precise method of converting the Ascorbic Acid to DHAA. Our DHAA-Vitamin C serum has a slight golden tinge to it and the ReCverin product is a crystal clear solution. All of the case studies reported here used our DHAA/Ascorbic Acid serum.